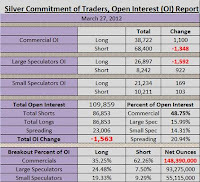 Silver increased $+0.649 this past reporting period and gold wandered down $-12.90 but do you know how they got there? Let’s look under the hood…! 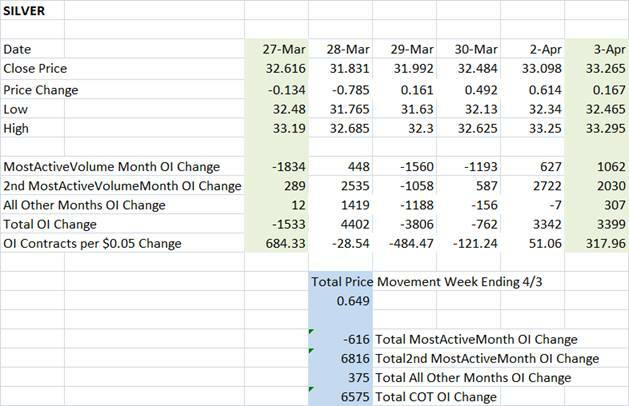 Here are the CME Daily Bulletin reports from last week. 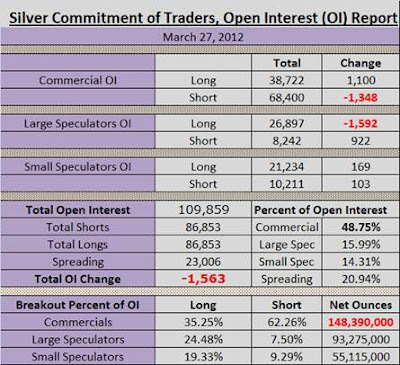 I picked silver from March 28 and Gold from March 30 to list from the Commitment of Traders reporting period of March 28th – April 3rd. Let’s go day by day. 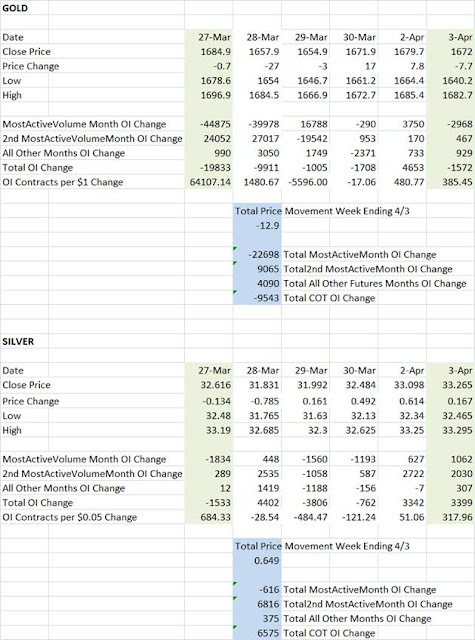 On March 28th, we see silver losing $-0.785 on the day but in the Most Active Volume Month (MAVM) the Open Interest increased 448 contracts. That is hardly what we would expect to see on a falling price day and in particular a day when price fell so dramatically. I have a theory as to what happened on that day but remember a theory is just an educated guess. Remember that spot price is determined by the MAVM total of Open Interest long + shorts but what we see on the reports is not for sure what happened during the trading day. The volume of contracts that traded during the 24 hours of the report was 38,344. 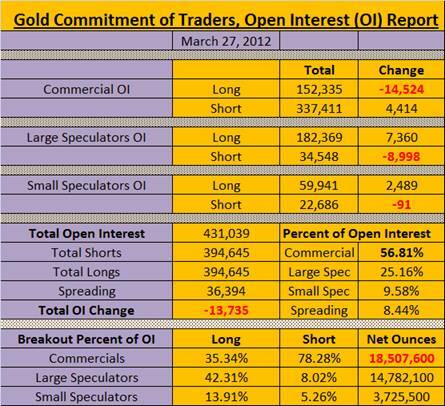 What we see on the report is just an addition of 448 contracts. What I believe happened during that session was a massive selloff followed by a more massive amount of long buying. Let’s say that 10,000 contracts were involved in the selloff followed by 10,448 long contracts purchased at or near the bottom. That comes out to a neat 448 contracts gained in the MAVM though the actual open interest activity during the day was tremendous. You might ask the question “what about the volume of 38,344 contracts during that day?” Easy. Just take 38,344 – (10,000 + 10,448) = 17,896 contracts left over. Then what are the 17,896 contracts? They are the contracts traded by the day traders and they are mostly sold off before the close of the day so they have very little effect on the ultimate spot price for that day’s closing. Day traders get in and out very quickly. Their mission is to catch a price move, rising or falling, ride the brief wave based on their personal boundary rules for profit and then get out quickly, hopefully making a profit. It the wave reverses and their stops are triggered then their profit may be very small, even minute. If the waves reverses right as they get in then they will probably suffer loss as their stops are triggered. If they aren’t thinking and forget to set their stops they may suffer heavy losses. I have heard horror stories of those losses. Next, on March 29th, we see the reverse where silver loses -1560 contracts in the MAVM yet price goes up $+0.161. Not a much of a change in price day so I am going to guess that some speculators sold off a small percentage of the longs they bought the day before because they were afraid the bottom was not yet in and also perhaps the day traders took the price down and scared them. Keep in mind that if -1560 contracts were lost that somewhere along the way contracts had to be bought in order for that price to have risen by the closing. On March 30th, we see -1193 contracts leaving the MAVM but there is a significant price rise of $+0.492! What happened there? There are several possibilities that come to mind but all of them fairly complicated so I will discuss just one theory. The very next day on Monday, April 2nd we see what looks like normal activity. Price rises $+0.492 and the MAVM gains 627 new contracts. My guess is those are new speculative longs. Then, on Tuesday, price rises $+0.167 and 1062 new contracts flow into the MAVM by the pit closing at 1:30PM EST in New York. Two normal looking days in a row! 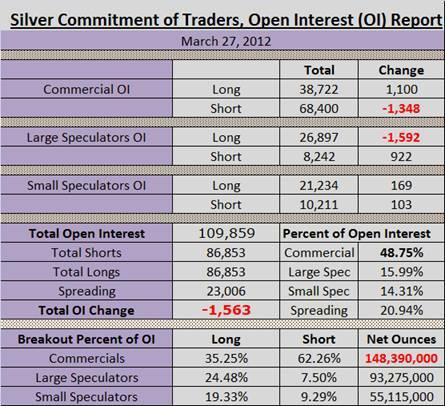 Except that on Tuesday afternoon silver gets hit VERY hard for a HUGE loss! And that loss carries over into Wednesday for a total of $-2.22 lost in just 24 hours of trading. I have waited until this afternoon to submit my report to the Doc because I wanted the final numbers in on Tuesday afternoon and Wednesday morning up to the 1:30PM EST closing. Since I have already showed you above how the numbers on a given day may not tell the whole story as to what really happened, you may even still be surprised by these numbers! It is almost absurd to look at, isn’t it? That is why it takes as lot of study to be a successful, active trader in silver and gold. We see that the total Open Interest gained a mere 654 contracts, the Most Active Volume Month gained a tiny 383 contracts and the 2nd Most Active Volume Month gained 18 contracts. What seems like very little change resulted in price drop of $-2.221 during this 24 hour period! That is the reason behind why I say that sometimes it is very obvious to me that the Commercial Banks allow or even orchestrate the rise in the silver and gold prices (like on March 30, April 2, and the morning of April 3rd) in order to lure speculative longs back into the game only to subsequently trash them very, very hard. All the commentators squawk about Bullion Bank price suppression. I have not heard any of them accusing the Bullion Banks of raising the price. The manipulation is probably far more insidious that they have yet imagined. Remember, these markets are absolutely rigged!! Be careful out there. 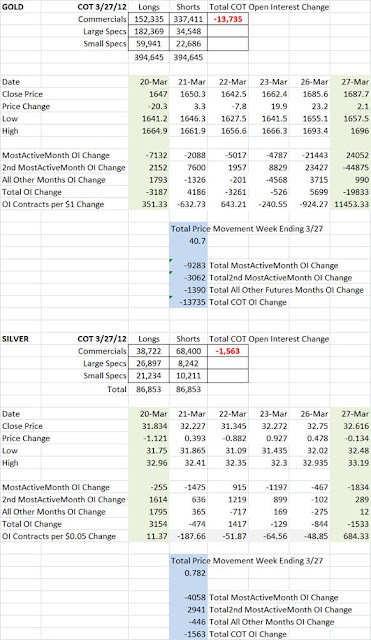 PS As always, this week’s and last week’s COT spreadsheets are at the bottom for your perusal.